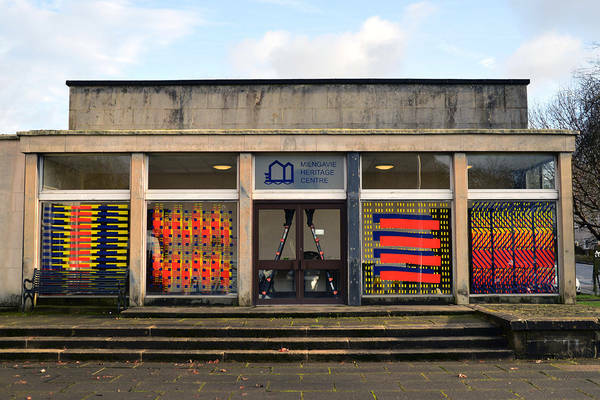 Celebrating the vibrant heritage of Burnbrae Dye Works and the Turkey red textile industry, Rachel has created a bold vinyl installation that spans the windows of the Milngavie Heritage Centre. Renowned for its striking colour and complex repeat patterns, the industry flourished throughout the 19th Century, employing around 600 skilled workers to create extensive lengths of meticulously printed fabric. Taking the pattern sample books held at the National Museum of Scotland as a starting point, through an experimental and laborious process, Rachel has extracted and fragmented shapes from textiles held within the archives. Working between tangible, hand-made collages to computer generated graphic designs, she highlights the shift in textile production – from complex hand- printed patterns to mass-produced digital prints – whilst creating more organic shapes and textures that express the subtle variation and movement within cotton material. Through this process she reflects upon the nature of heritage itself, considering what is highlighted and made visible, which aspects have been left out and forgotten, and how stories from the past are adapted and interpreted over time. 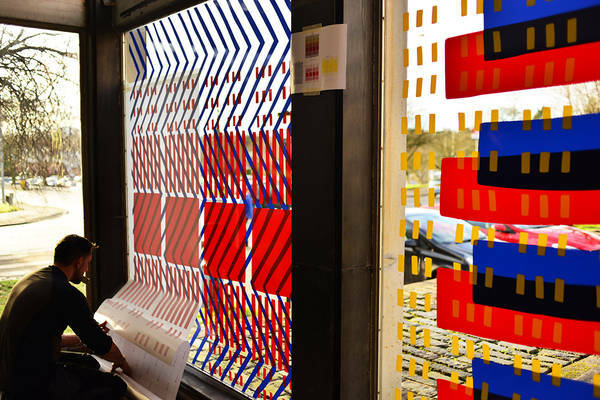 Similarly to the Turkey red printing process, patterns within the artwork have been constructed from distinct layers of colour, which blend in their transparencies when viewed from the interior space; temporal patterns are cast through the windows, shifting and fading with the changes in sunlight. Despite the limited records of original designs created at Burnbrae itself, the artwork imagines how the patterns made in Milngavie may have looked once magnified. 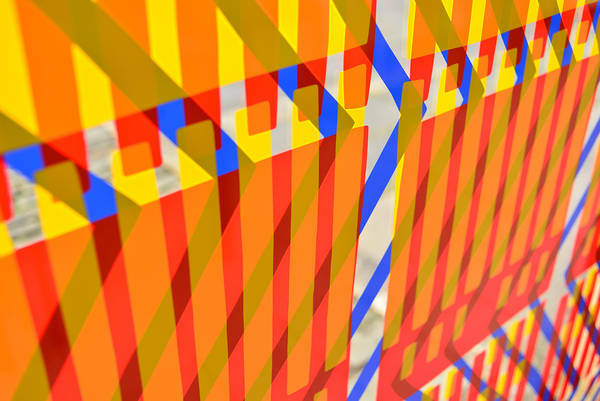 Working with the architectural framework of the building, Rachel aims to activate the Heritage Centre through her bold and eye-catching design, transforming the building through colour and pattern. 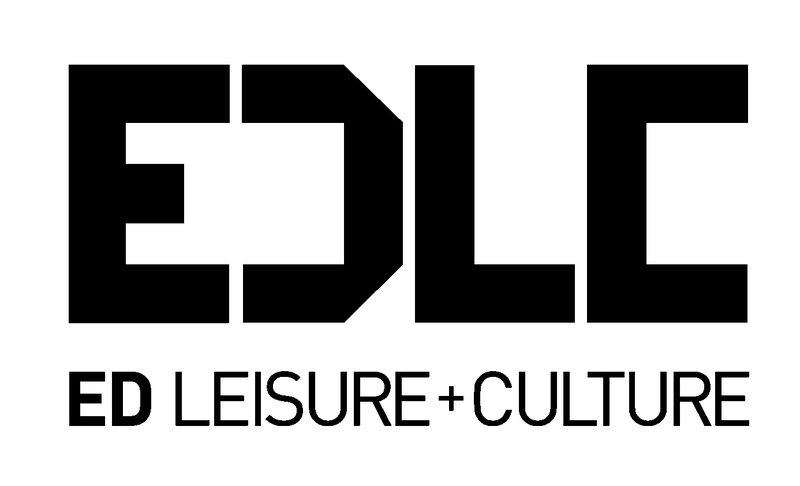 The artwork strives to highlight this incredible local industry – the immense creativity and craftsmanship that drove its success for so many years – sparking conversations and inspiring new audiences to engage in their heritage.